Oh no, a not-corvid! However, I thought I’d share what has been keeping me so busy. 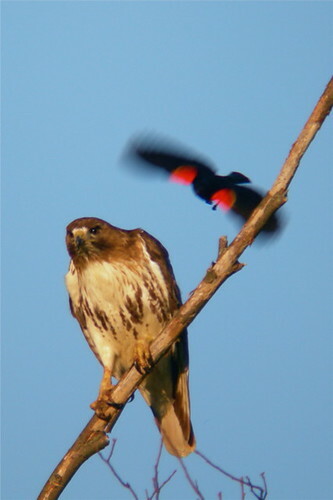 Meet Rusty, my red-tailed hawk (Buteo jamaicensis), beautifully photographed by my friend Melissa Penta. My husband and I obtained our apprentice falconry licenses and Rusty here is our first bird. 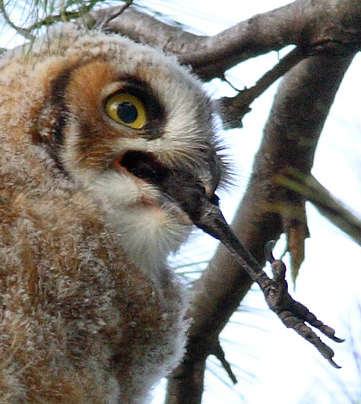 He’s a juvenile (hatched in the wild this April or May) and was trapped in January. He’s a small male and his personality has made him an absolute delight to work with. 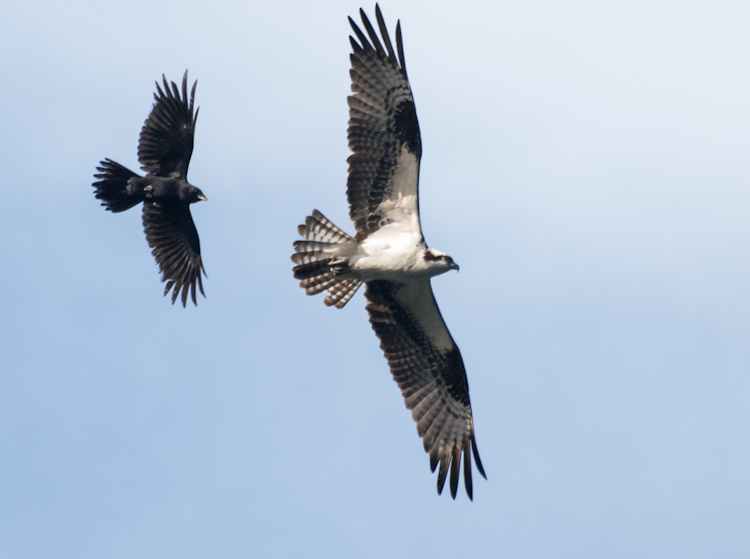 If you have any questions about falconry, feel free to ask, however, since this IS a corvid blog, I’m going to briefly talk about the relationship between these guys and corvids. 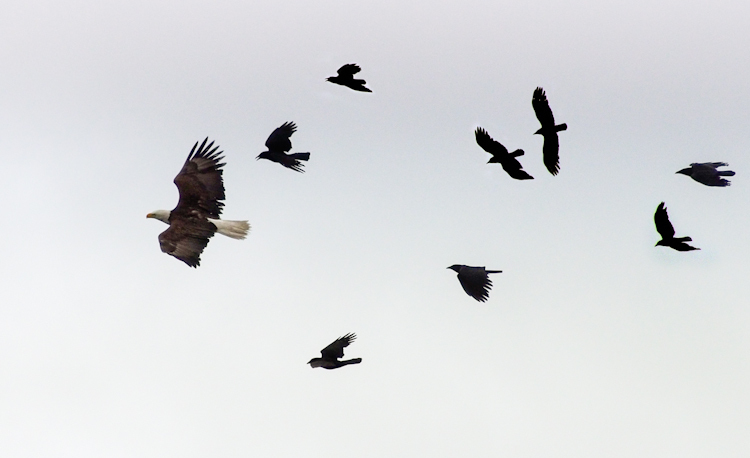 I’m sure if you have spent any time observing or reading about crows you know they exhibit mobbing behavior. 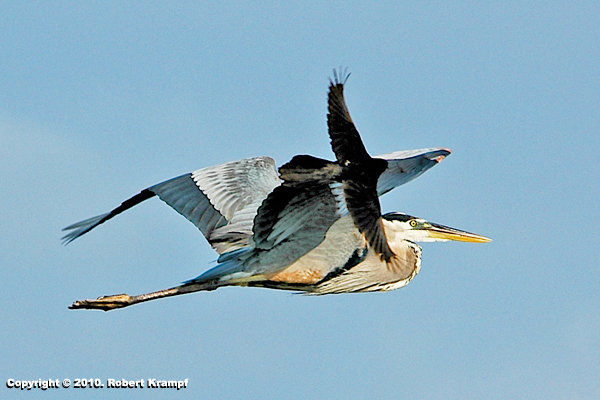 This means they dive-bomb, peck, chase, and scream at predators they find threatening, even going after predators many times their own size. (I have certainly been mobbed during banding season!) What makes it “mobbing” behavior is that they recruit family, friends, and neighbors to help them drive the predator away, or anything perceived as a threat, no matter how seemingly benign. 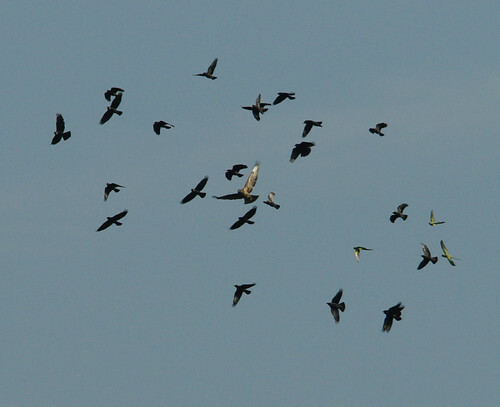 Smaller crows will even mob bigger crows. It’s not just the crows that do this, many corvids show this behavior such as magpies and jays (but seriously, what won’t jays scream at? 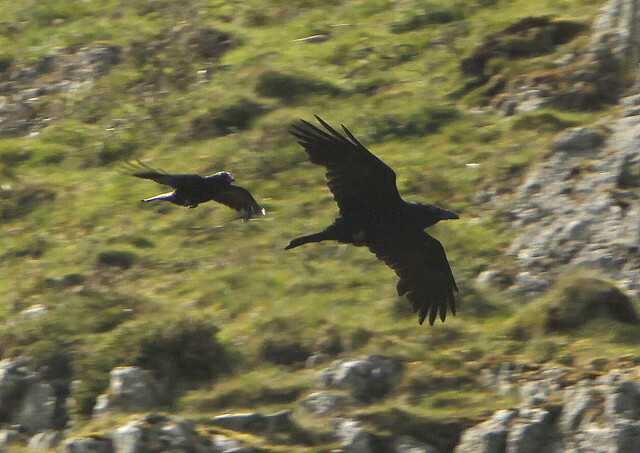 ), however, this post will focus on crows. This behavior often looks quite dickish, as many times the target of the crows’ ire is simply sitting still in a tree or trying to eat a meal. 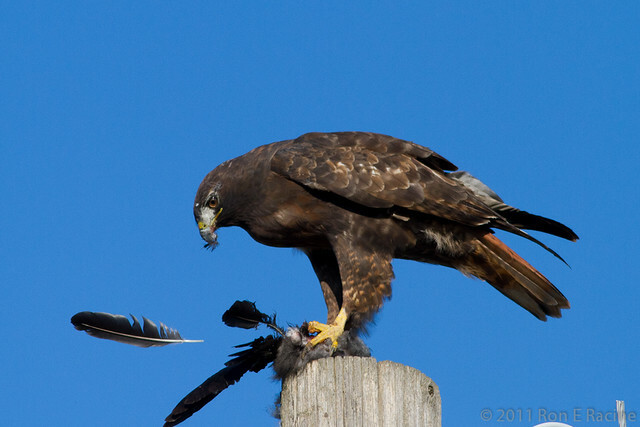 However, raptors are quite a threat to crows. 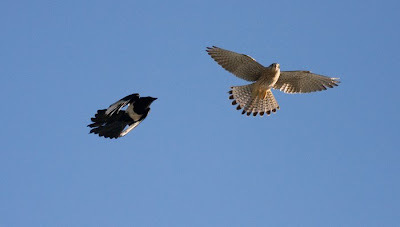 Even if one may seem too small to be a threat you need to keep in mind that raptors are quite powerful for their size (here is a video of a sparrowhawk on a jackdaw; please note this is a predator/prey interaction video and it may be distressing to sensitive viewers…though spoiler alert, the jackdaw survives). 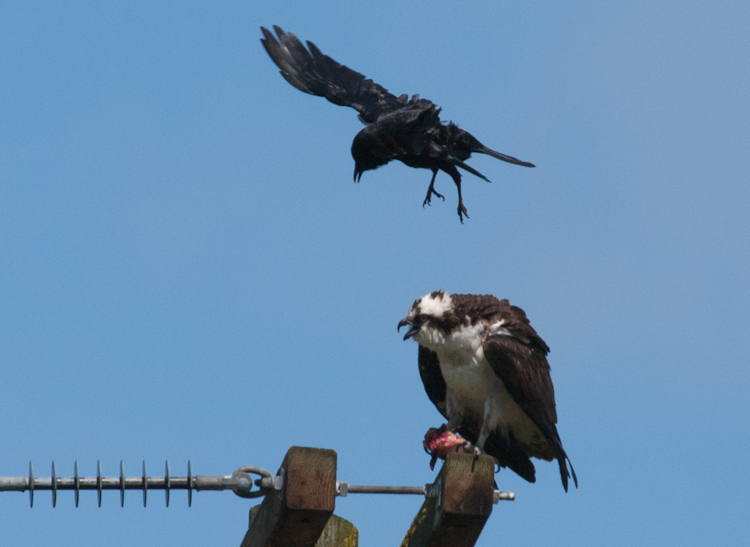 Even cousins aren’t sacred as ravens are often chased off as vigorously as a raptor because they can certainly be a threat (here is a juvenile raven eating a fledgling crow). 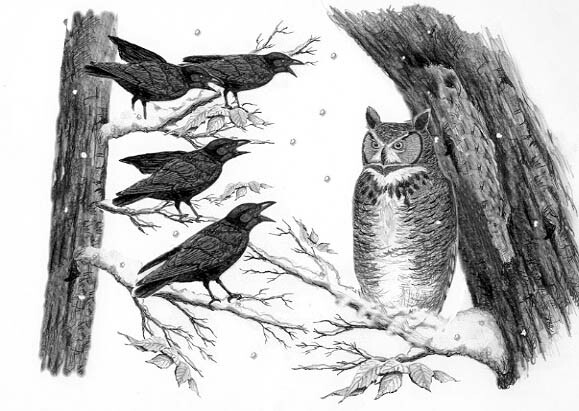 So, is it a mystery why crows might act so defensively to any predator/threat they see? Not really. I find anti-predator behaviors quite interesting. 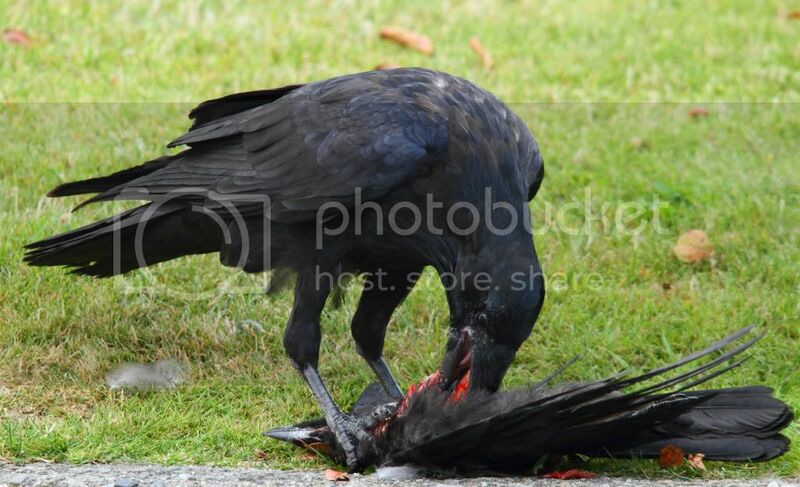 When mobbing occurs (note: this is also seen in other animal taxa, not limited to corvids or even birds) you don’t just see kin helping kin, you sometimes see entire communities of unrelated individuals banding together to make their neighborhoods safer. Sounds a lot like what we do! 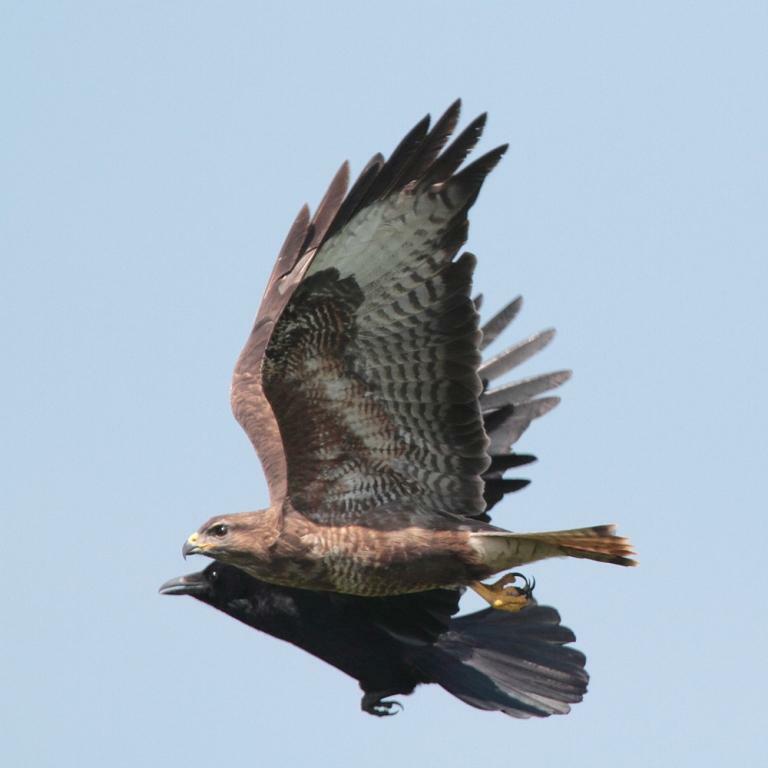 So as I fly Rusty and hunt small game with him I fully expect to get some crow visitors who are none too pleased to have a hawk in their domain (in fact we’ve already had a few at a local park), but in the end, can we really blame them? This entry was posted in Uncategorized and tagged american crow, behavior, blue jay, buteo jamaicensis, corvid, corvid blog, corvidae, crow, falconry, goshawk, great horned owl, hawk, hunting, jackdaw, jay, magpie, mob, mobbing, owl, predator, prey, raven, red-tailed hawk, sparrowhawk on February 3, 2013 by The Corvid Blog.